APPEARANCE: Waniguchi is a tsukumogami which comes from the circular, hollow bells found at shrine entrances which are rung when praying to the shrine’s gods. When one of these bells becomes a yokai, it sprouts a reptilian body and tail, and the bell becomes the creature’s head, opening and closing just like a real crocodile’s mouth. ORIGIN: The bells at shrines are called waniguchi due to the wide split along the bottom rim, which gives them the distinct look of an crocodile’s mouth. 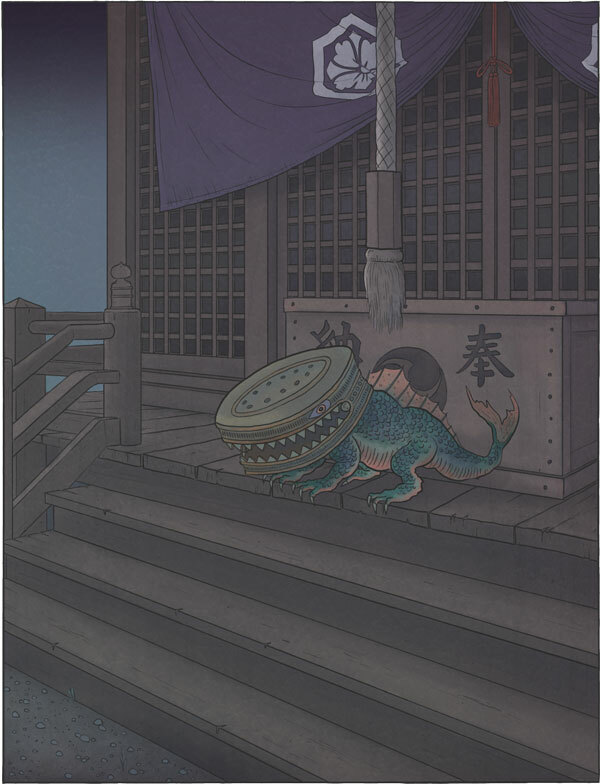 This yokai first appeared in tsukumogami picture scrolls as a pun based off of the word for shrine bell.